Managing user accounts in Microsoft Active Directory is an open challenge to every IT administrator. Manual configuration of user properties using the native Active Directory tools or other options like PowerShell, etc. is extremely time consuming, tiresome, and error-prone, especially in large and complex windows network. Moreover, an in-depth knowledge of Active Directory and Active Directory management is an essential requirement to accomplish these tasks. ADManager Plus is a web-based software that allows you to create and manage multiple user accounts in the Active Directory in a single action. Further, using this software, you can also create Exchange mailboxes, new user accounts in Office 365 and also G Suite for all the desired users, right while creating new accounts for them in Active Directory. It allows you to create multiple templates that contain standard user attribute values, which can be applied while creating users in bulk. You can import the user attributes from a single CSV file while creating user accounts, thereby minimizing the time and efforts needed when the native tools are used for Active Directory user provisioning. You can even export users with absolute ease using this tool which doubles up as a Windows permission management software. This tool also allows delegation of rights to helpdesk technicians or non-administrators to create users. With delegation you will have ample time to focus on critical tasks as you are freed up from the repetitive and trivial tasks. Using reactive user account management, you can even manage multiple attributes of user accounts in just a single step. 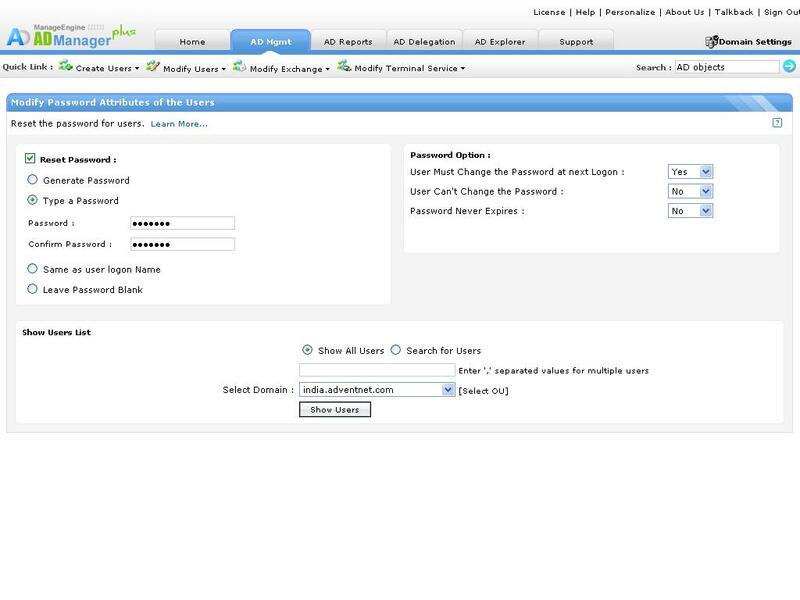 Further, this feature even allows you to set rules to automatically configure or update certain user attributes while performing user management tasks. Also, with the automated report generation utility, you can manage not just the user accounts but the entire Active Directory proactively and efficiently. I would not able to perform my role as Microsoft Sharepoint Portal server administrator if I didn't get to know about ADManager Plus by ManageEngine. A tool to manage Windows server Active Directory. 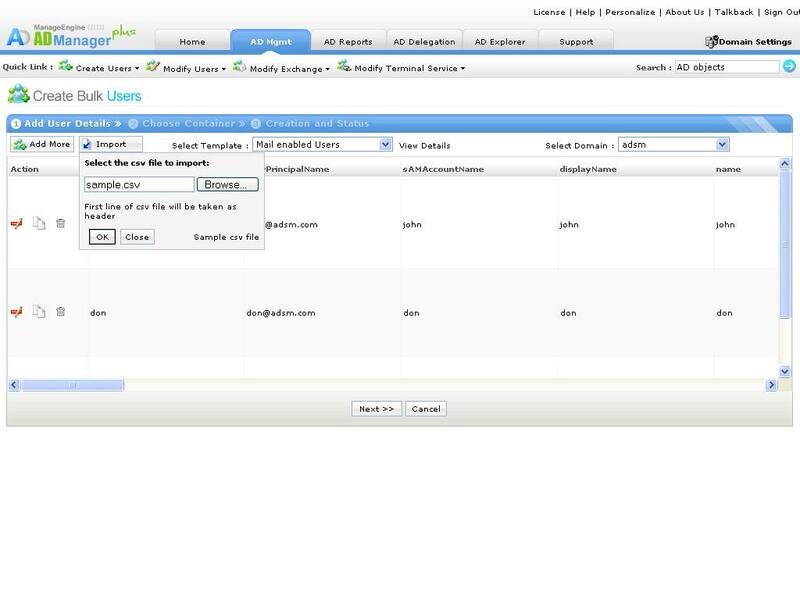 ADManager Plus simplifies the process of creating and managing users, in bulk, with just mouse clicks. Create users in bulk in a domain by specifying all the attributes including Exchange (2003, 2007, 2010, 2013), Lync/LCS/OCS, Terminal Services, Office 365 & G Suite attributes via user provisioning templates. Add users by copying properties of another user. Import user properties from a CSV file, with the only mandatory property being the User's name (givenName). Create and use templates with common user attributes. Create users in an existing container or create a new OU in a domain and add users to it. Modify the Name, Display Name, Logon Name, and SAM Account Name formats. Enable/disable users, Unlock users, and set user account expiry. Set Home Folder, Profile, and Script Path for users. Updating membership of Groups and Distribution lists. Mobile-based User Modification. More about ADManager Plus mobile apps. Create Exchange Server 2003, 2007, 2010 and 2013 Mailboxes for users. 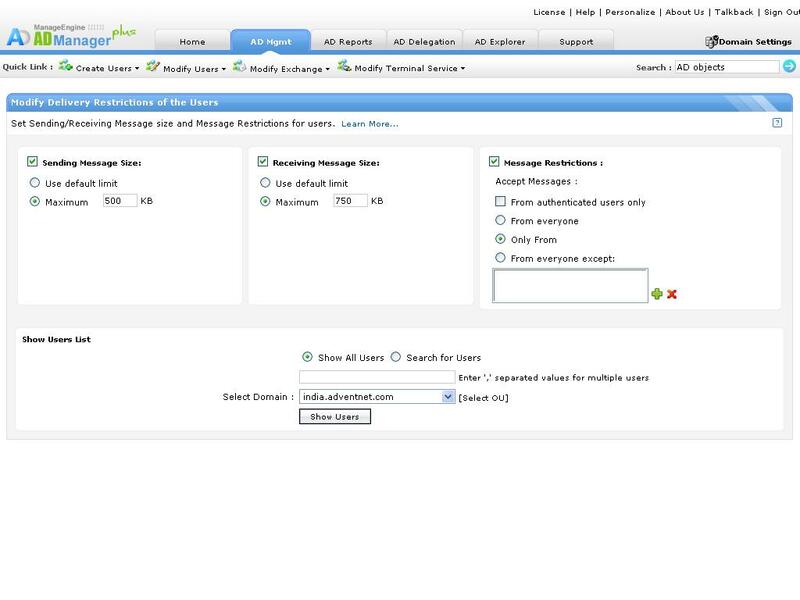 Set Sending/Receiving Message size and Message Restrictions for users. Set the Mailbox Storage Limits and restrict Forwarding Addresses for users. Modify the mail storage limits and deleted item retention policy. Enable/Disable Outlook Mobile access, Outlook Web access, IMAP4 and POP3 protocols. Try all the bulk management features of this tool using the free download of its trial version. Modify Terminal Services Home Folder and Profile Path for users. Modify start programs for users logging from Terminal Services. Modify session duration, active session limit, idle session limit, etc. 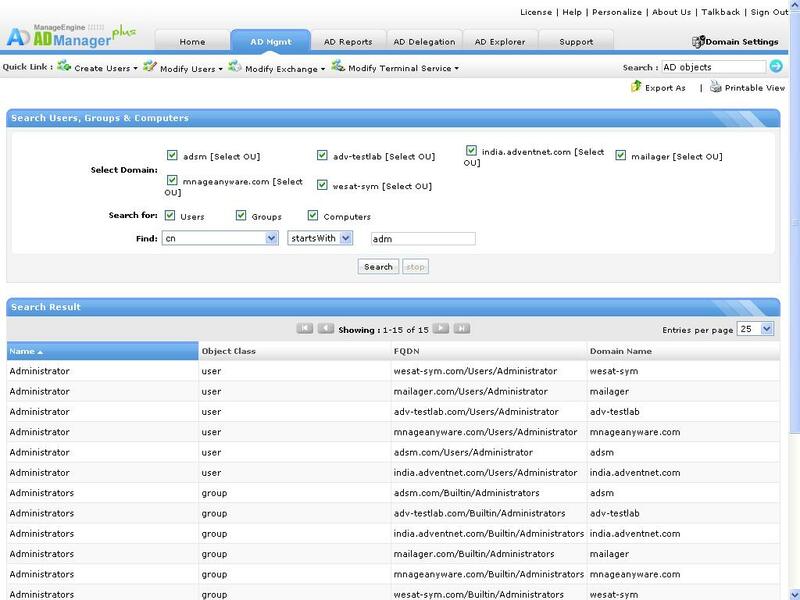 Search users, groups, computers, and OU's in the domain. 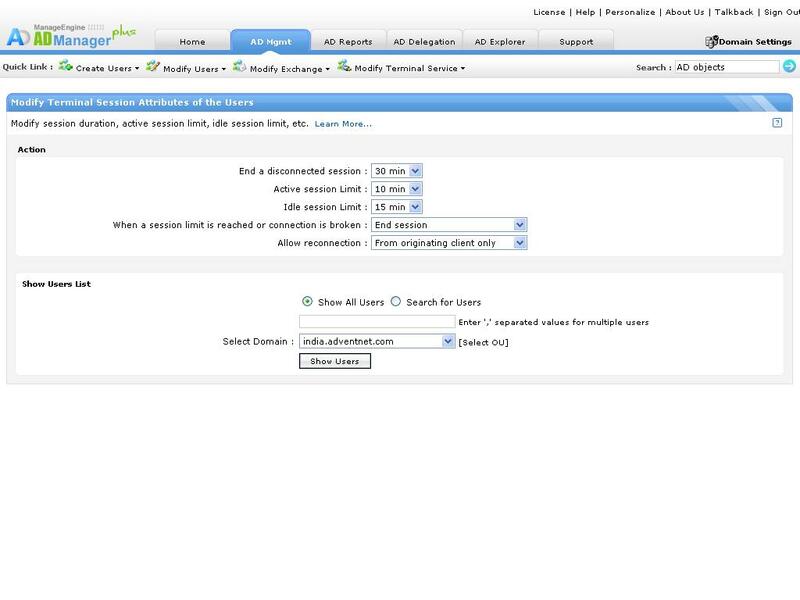 Restrict search to specific OU's of the domains. Options to include common name and description in the search criteria. Simplified and easy Active Directory management through ADManager Plus' completely GUI based features is certainly a great relief from the draining task of Active Directory management. In fact, this tool goes even further and helps you to automatically execute all crucial and repetitive tasks through its automation feature. And all these without using even a single line of script or PowerShell. This is the easiest that Active Directory management can get!